The real crime when it comes to this movie is that up until a few years ago, I'd never seen it. Chalk it up to semi-creepy trailers and overall darkness that kept me from seeing it as a child. As it turns out, it really is all it's cracked up to be. 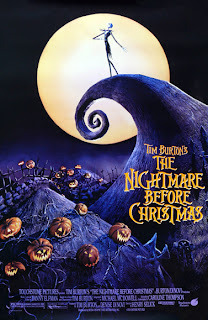 In the era where Tim Burton was known for his imagination and creativity (as opposed to cha-ching bombast and obsession with the Depp/Bonham Carter combo), this bizarre and freaky musical brought the instrumental (and surprisingly) voice talents of Danny Elfman to the forefront, showcasing the story of Jack Skellington, a hopeless dreamer who discovers there are other holidays outside of Halloween. The stop motion is phenomenal and ugly-pretty, with kooky characters that couldn't be matched until 2009's Coraline. It certainly doesn't hurt that the wonderful Catherine O'Hara plays love interest Sally, who's made up of the parts of cadavers. The music is supremely catchy, from the bouncy "What's This" to the jazzy "Oogie Boogie Song" to the somber "Jack's Lament." It's strange, unmatched and a holiday classic.